Stu's results (BJJ Instructor): Silver in the Senior Men under 100kg, Gold in the Young Masters plus 90kg, and Silver in the Young Masters Open weight division. Stu is a black belt instructor at aucklandbjj.com and also trains and compete in Judo (at brown belt level). 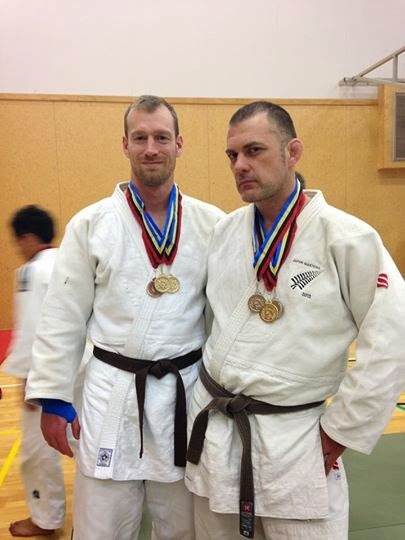 He trains at Auckland University Judo Club. Paul Wood: Bronze in the Senior Men under 90kg, Gold in the Young Masters under 90kg, and Gold in the Young Masters Open weight division. Paul is a brown belt in Judo at Auckland University Judo Club. see http://www.judokong.com/ for details. Paul Wood also cross train in BJJ at Aucklandbjj.com when he has some free time. Congrats to Stu and Paul.